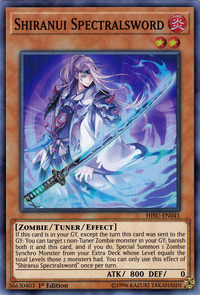 If this card is in your GY, except the turn this card was sent to the GY: You can target 1 non-Tuner Zombie monster in your GY; banish both it and this card, and if you do, Special Summon 1 Zombie Synchro Monster from your Extra Deck whose Level equals the total Levels those 2 monsters had. You can only use this effect of “Shiranui Spectralsword” once per turn. This monster appears in the artworks of Shiranui Samuraisaga, Shogunsaga, Sunsaga, and Swordsaga.